Botanically a berry, the Grape is a deciduous, woody vine of the flowering plant genus Vitis. Its well-known, highly popular fruit is non-climacteric, and generally grows in clusters. The cultivation of the domesticated Grape is traced back between 6,000 and 8,000 years ago in the Near East, with the primary purpose of winemaking. Occuring in clusters of 15 to 300, the Grape ranges vastly in size and color, including crimson, black, dark blue, yellow, green, orange and pink. The Grape has played a significant role throughout history across numerous cultures, and both its leaves and fruit remain found in the diets and cuisine of people on every continent. With mild weather and numerous microclimates, the Southern California region is ideal for growing almost all Grape varieties. They perform most ideally with 7 to 8 hours of daily direct, full sun, good water drainage and lean/loose soil. Commercially introduced by the NY Agricultural Experiment Station, the Himrod Grape’s round, seedless, white table fruit is known for its sweet flavor and rapid ripening. The Himrod Grape is a reliable producer, and its fruit is typically eaten fresh. Medium to large in size and round to cylindrical in shape, the fruit of the seedless Princess Grape grows in loose, large clusters. Its skin is smooth, shiny and light green, and its juicy, crisp, sweet-tart taste hints of muscat flavor. This white, seedless variety has a delicate, sweet and unique flavor, and is often dried and made into Sultana Raisins (“Sultanas”). 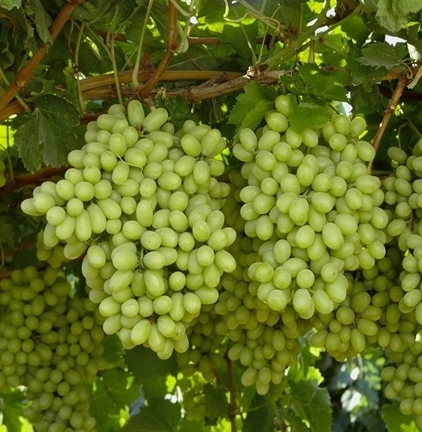 Originating under the Ottoman Empire, the Thompson Seedless Grape has been a long-time crowd favorite, and is the variety most often seen in grocery stores today. Bearing the namesake of Tom Midgely, who discovered it in southwest Utah in 1965, the Midely’s Purple Grape yields a seedless fruit with reddish-purple skin. The large, long fruit clusters have an extended harvest season from August through September, and their taste is rich, sweet and perfect for fresh eating as well as creating raisins. The Canadice Grape is a cross between the Bath and Himrod created by the NY State Agricultural Experiment Station in 1977. Its red, seedless, medium-sized fruitgrows in large, cylindrical and compact clusters, and has a pleasing, slightly spicy flavor for fresh eating. A new variety introduced in 1997 by the Agricultural Research Service in Fresno, California, the Autumn Royal Grape yields firm, generally seedless fruit in October that is oval-shaped and approximately an inch in length. The fruit’s black or purple-black skin covers translucent yellow-green flesh that is delicious for eating. The Crimson Grape has rich history reaching back to the regions of South Africa and South America, as well as throughout Australia, where it has been successfully grown since 1788. Aptly named, the Crimson Grape produces fruit with bright crimson skins and juicy, seedless flesh with a sweetly tart flavor.